Just imagine you are out to do some refreshing swimming, you get into your pool and all you can notice after being away for some time, is that annoying dirt, disturbing wreckages, unfriendly algae and so many dingy stuff in your pool. This would leave you wanting the best of your swimming pool. You have no time to worry; a robotic pool cleaner can do your pool some justice. The best pool cleaners are designed to direct themselves under low-voltage automated pool vacuums, to specifically do the cleaning of your pool floor including the walls and steps of your built-up swimming pool. Going through the time-consuming bustle of identifying the best robotic pool cleaner can be one of the overwhelming tasks. Relax, because I have prepared for you the most informative review on what exactly to look out for. Don't go for those too cheap at the expense of quality as well. Pool cleaners come in various types, from the suction, pressure to robotic ones. They also can range from low, mid to the high-end cleaners. This means too; you will come across those that come with strong suction ability, those with swivel cables to those that aren't likely to be twisted and even those with cartridges easy and fast to use including cleaning. The following factors should be at your fingertips when getting the best robotic pool cleaner. Robotic cleaners come with design ratings suitable for different pool sizes with variant cord lengths. Check the most appropriate that meets your pool specifications. This would include the distance between your pool, and the nearest electrical source for your cleaner power supply for flexible cleaning motions of your cleaner. Establish whether you need a robotic cleaner that can or doesn't need to climb a wall. For those that can climb a wall, they should be able to scrub the vertical surface of your pool wall. This will majorly depend on the manufactures design of the pool cleaner. Those that don't climb the wall would do your floor cleaning, implying you will have to do the wall clean-up. Robotic cleaners have an in-built filtration system to assist is filtering your pool water and also collect that unwanted debris. Establish whether your robotic pool cleaner filter is a bag or a cartridge. Check whether the best filter too that can be easily cleaned and even reused. This will cost cut for you filter replacement costs in the long run, as replacements can be less regular. Some cleaners come with one or more cleaning cycles normally programmed into the machine. The cleaning cycle will determine how long your robotic pool cleaner will run before shutting off automatically. Check if you can use a remote control with your cleaner, if this could be your additional interest too, you want on your machine. The remote control will provide you with that convenience of directing your robotic pool cleaner to areas of your interest, for not only for fast cleaning but also more specific clean-up. Remote ability will give you a chance to get the machine off areas it could be stuck during your cleaning too, without necessarily having to get into the pool. You will need a pocket-friendly price for your machine, but don't compromise to get cheap at the expense of your quality interests. Check out if you need to get a pool cleaner's Porter separately, the porter will help you with the convenience of moving around your cleaner and power supply to locations of interest. You need a robotic cleaner that is efficient, cost-effective, advanced in technological design and very easy to use. 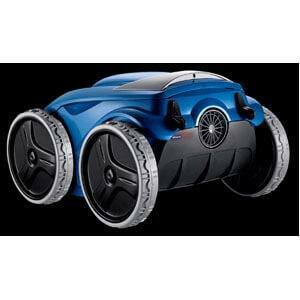 Those four-wheel drive technologies are suitable for mobility purposes. Mostly you will find these brands safe to operate, have long working hours, consume less energy and are automated for that efficient filtration for your cleaning. You will find them less noisy, and you will need less chemicals to use them in your clean-ups. 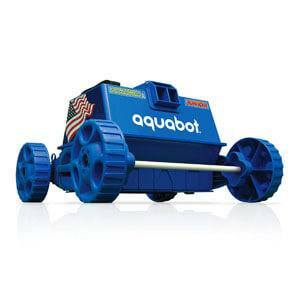 The Aquabot Pool Rover Junior is commonly designed for residential above-the-ground pools. 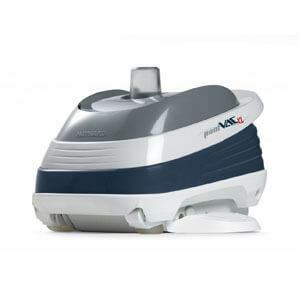 This vacuum cleaner is dedicated for micro-filtering dirt, debris and other impurities from the pool floor. Expect the best cleaning convenience thanks to the unique filtration design capabilities of this pool cleaner. It comes with an easy to access bottom filter filtration system able to reach even the smallest of the particles during that all-round pool cleaning exercise. Its Aquabot pump is able to filter slightly over seventy gallons in a single minute of water; this is attributed to its unique suction power. It is accompanied by a 40-feet cable plus a suitably fit power supply of up to 2 to 3 hours. Expect to use less energy, water, and chemicals to carry out your pool cleaning tasks. The debris is self-contained in the unit. It provides you with one the optimum water circulation and filtration thanks to its Aquabot. You are likely to spend less power costs too. This model holds high safety standards and performance; this makes them safe to the user with minimal chances of injuries. This cleaner embraces patented hydro-robotic technology. The technology makes it convenient for you to use less and cheaper repairs, few parts and the machines too has one of the greatest suction power capabilities. It has one of the best filtration systems in the industry geared to maximize all your cleaning concerns; it is simple to use thanks to its adjustable axle pin for optimum pool cleaner coverage with no cable twisting. The Hayward 2025ADC Automatic Suction Pool Cleaner is more fast and efficient compared to the regular ones in the market. It embraces the latest technology pivoted to user-friendly convenience. You can't go wrong with this model if energy saving is part of your priority. It comes with a top debris chamber and a filtration cartridge that brings you all round motion of cleaning, in fact, you will not have to turn the cleaner upside or downwards while cleaning to have problems with the cleaning bag. It can clean all pool surfaces courtesy of its scrubbing brushes will do away with those stubborn stains and dirt. All debris and unwanted deposits will be exposed for removal to the filtration system. This is highly credited to its pool VAC XL system that can make right and left turns for systemic coverage of the pool surfaces. Expect to cost cut on the need of acquiring extra equipment to use this cleaner. It is one of the simplest robotic pool cleaners to use, with fewer disturbances in operating. It comes with one of the best suction pool cleaning systems. This is in part due to its connectivity to the power supply of the filtration system. This means the booster pump will translate to your fewer energy costs. You don't have to empty or replace the debris bag manually; this cleaner automatically does this by itself at your convenient locations. This brings you that glittering cleaning effortlessly. After installation of the pool VAC XL, with you is the best automated operation and a clean pool. 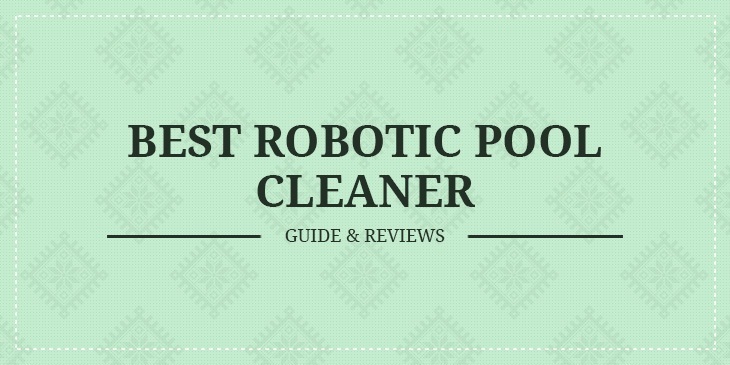 This cleaner utilizes the latest robotic pool cleaner innovations in the industry; you will expect fast cleaning, hustle-free further bringing down your energy costs. The Hayward top notch two fine porosity filtration systems with that sleek floor cleaning intended design. With a unique easy to access debris chamber and filtration cartridges, you can equally move in any angle while in motion. No need to bustle with messy bags too. This is one of those cleaners that is moderate and well-matched for most pool surfaces. It will scrub for you most of the stubborn pool dirt in the shortest of time. Thanks to its advanced embrace of modern technologies, it happens to be one of the most less costly cleaners for the consumer. The power it consumes would be equivalent to that which can be consumed by a standard light bulb. 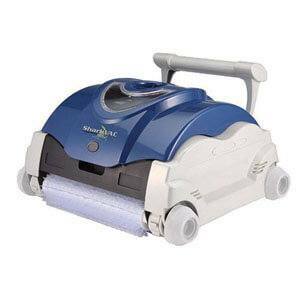 TheHayward RC9740 SharkVac Automatic Robotic Pool Cleaner comes with a micro-processor technology; this is to ensure you get optimized and most effective cleaning consistencies every time you use this machine. It quickly removes cartridge filters and debris from your pool. This one of the most advanced robotic cleaners. This is pegged on its unique and exceptional aspects for the best cleaning needs. It is patented and available at pocket-friendly model varieties for quality. It is mostly recommended for in-ground residential pools. You are likely to do your pool cleaning within an average period of just 3 hours, thanks to its ability to perfectly scrub, vacuum and filter your pool surfaces instantaneously at your command. It comes with the easiest to clean cartridge system with an accompanied spring clean-up capability. 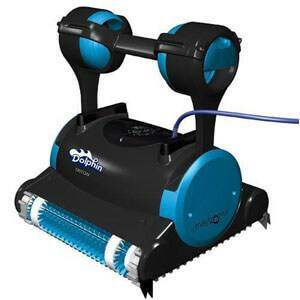 You will find it easy to carry the Dolphin 99996356 Dolphin Triton Robotic Pool Cleaner around, for your storage needs. This is credited to its patented swivel cable with a caddy that eliminates chances of twisting. This is one best cleaner that brings you automation matching your problem-solving requirements. You won't need to pre-install the cleaner or connect it to the pool system. It is self-programmed for detect the necessary cleaning required. This is a remote controlled robotic pool cleaner. It is one of the best in cleaning speed and convenience than any regular brands in the market. This advancement brings you the capability to clean debris to four times more than other pool cleaning machines. This is achievable without losing suction. It comes with top notch easily accessible large filter canister, for multiple cleaning abilities, saving your time and money. Expect this pool cleaner's 4WD technology to clean not only your pool but also its walls. It will scrub the tile line perfectly thanks to its pleated scrubbing brush. This is a programmable 7-day cycle cleaner with an all-purpose filter canister meaning your fewer filter cleanings and less costs. It has a sensor that automatically senses its position in the pool and tailors itself to a location for maximum cleaning, but still the tangling of the cord. Its compact caddy for moving around the machine its designed without tools. Properly maintain your machine with appropriate storage for it to serve you longer. Check on those that use less energy and low chemical usage to reduce running costs. The ability of the cleaner to climb walls is a plus. You too don't need a noisy one too. Any of these brands are geared to provide you the best pool cleaning services. They are value for your savings.